Morgan painted a beautiful French countryside in my dining room. It is now the most beautiful spot in my house. She listened to me and my husband and painted exactly what we had in mind. Her work is fantastic and she did the entire mural in less than a week. The only regret I have is that she worked so quickly I didn’t have more time to spend with her. I reccommend her to all my friends and most of them also have Murals by Morgan in their homes now. 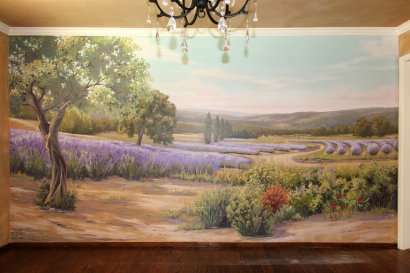 View detailed photos of the French provincial countryside mural Morgan painted for Alice.